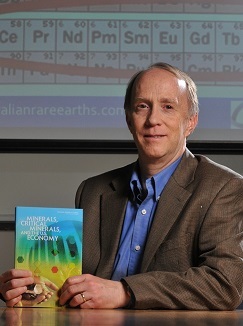 CMI researcher Rod Eggert is a geochemist turned economist. More formally, he is professor and former director of the Division of Economics and Business at the Colorado School of Mines, where he has taught since 1986. As deputy director of the Critical Materials Institute, he works with the director and the rest of the leadership team to guide and manage CMI, oversee the supply-chain and economic analysis that provides the context for CMI’s technical research, and chair the data management committee. On May 9, 2018, the Committee on Earth Resources of the National Academies held a workshop on Critical Minerals and Materials in Washington, D.C. In his keynote talk, CMI Deputy Director and Colorado School of Mines Professor Rod Eggert discussed how the field of critical minerals and materials has evolved in the ten years since publication of the National Academies’ Minerals, Critical Minerals and the U.S. Economy. Eggert chaired the study committee that prepared the report. In his talk, Eggert noted how the chemical and physical properties provided by a number of minor metals enable modern engineered materials; described advances in methods for evaluating which mineral resources are “critical” and why this determination inherently depends on who you are, where you are and when you ask; and emphasized the essential roles of education and research in enhancing primary resource production, improving recycling and reuse of materials, and developing new and better materials. Before joining Colorado School of Mines, Rod taught at Penn State University and held research appointments at Resources for the Future (Washington, D.C.) and the International Institute for Applied Systems Analysis (Austria). Between 1989 and 2006, he was Editor of Resources Policy, an international journal of mineral economics and policy. He has lectured around the world on the economics of mineral resources, including rare earths and other critical elements. Rod received the 2010 Mineral Economics Award of the American Institute of Mining, Metallurgical and Petroleum Engineers. He chaired the U.S. National Research Council committee that prepared the 2008 study Minerals, Critical Minerals, and the US Economy (National Academies Press).